What a day for the May 2016 Greater Atlanta Coin Show, temperatures in the low 70s with sunshine and clouds. Just a beautiful spring day to be out and about. And, that's what many people did with lots of them visiting the coin show's bourse to see what the dealers had on display. As always, we appreciate the many people who visit the coin show, the dealers that fill the bourse, our security and the hotel's staff that supports the show. Many dealers filled the tables positioned around the ballroom with their showcases full of a variety of collectibles. 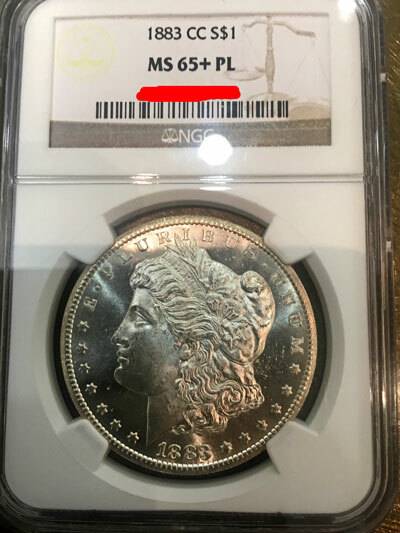 Let's take a look at a few of the beauties on display starting with a couple of 1883 CC Morgan Dollar coins. In 1883, the US Mint produced over 28 million of the Morgan dollars at their Philadelphia, New Orleans, San Francisco and Carson City facilities. Of the minted coins, Carson City produced less than five percent or just over 1.2 million coins. 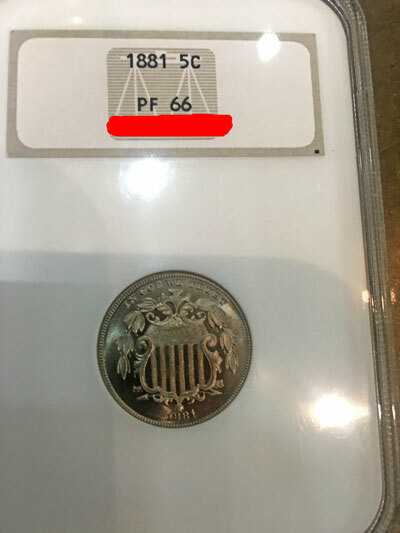 NGC (Numismatic Guaranty Corporation) graded these two examples with one as MS-65 DPL and the other as MS-65+ PL. No trace of wear; nearly as perfect as the MS-67 except for a few additional minute bagmarks or surface mars. Has full mint luster but may be unevenly toned. Any unusual striking traits must be described. One of the coins shows MS-65+, which makes it better than an MS-65 but not quite good enough for the next higher grade. NGS also noted DPL and PL on the coins. DPL is an abbreviation for Deep Proof Like defined by the ANA as an uncirculated coin with a high degree of proof like surface, more than a PL (Proof Like) but less than a DMPL (Deep Mirror Proof Like) coin. Side note, in that year, the Mint produced just over 1000 true proof coins at their Philadelphia location. So, which is better? An MS-65+ Proof Like or an MS-65 Deep Proof Like? 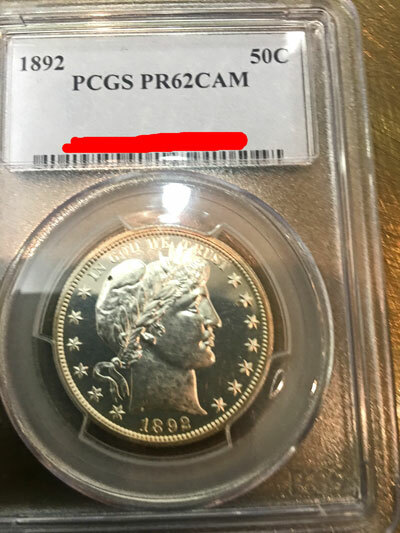 Next on our tour of the bourse is a PCGS (Professional Coin Grading Service) 1892 Liberty Head or Barber Half Dollar Coin from the Philadelphia Mint. In that year, the US Mint produced just under 2.4 million of the half dollar coins at their Philadelphia, New Orleans and San Francisco locations. The Philadelphia Mint struck almost 40% of the coins including 1245 proof versions with the remaining quantity for circulation. PCGS graded this 1892 Barber half dollar coin as a PR62CAM. An impaired or dull character may be evident in the Proof fields as well as on the higher areas. Clusters of small marks may be present throughout, with a few large marks or nicks in prime focal areas. Hairlines will be heavy and very noticeable. Large, unattractive scuff marks might be seen on major features. Overall eye appeal is barely acceptable for coins struck in precious metals. Copper coins will show a diminished color and tone and may be sub-par in appearance and appeal. Contact Marks: May have distracting marks in prime focal areas and/or secondary areas. Fields: May be original or impaired, with mirror surface dull or hazy. Eye Appeal: Varies widely for silver and gold, generally low for copper and nickel issues. Contact Marks: Several small; a few may be in prime focal areas. Hairlines: None visible without magnification. Fields: Above average. Fully original. Let's begin with the oldest five-cent first, an 1881 Shield nickel. The US Mint produced less than 75,000 of the 1881Shield nickels and only at one location, Philadelphia. Of those, the Mint made just over 3500 proof versions. 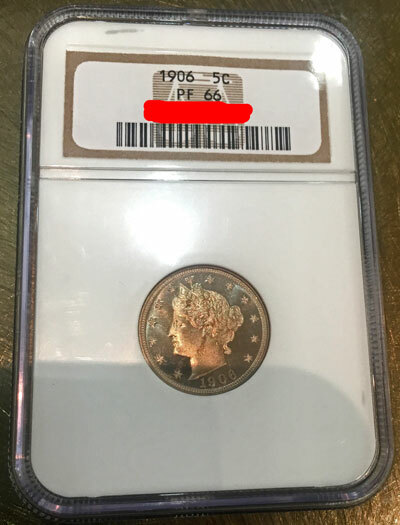 NGC graded this 1881 nickel with its beautifully detailed shield on a shiny field. 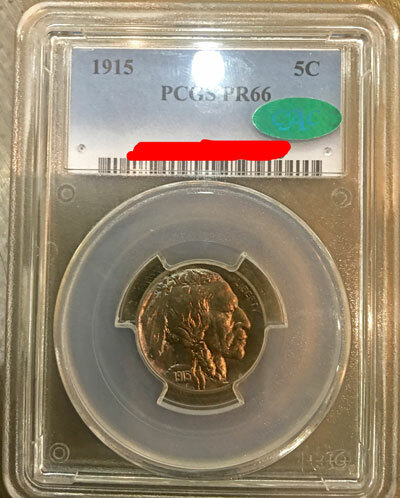 PCGS also noted this coin as CAM in its grading. Per the ANA, CAM is an abbreviation of cameo contrast, which, on a Proof coin, denotes the contrast between a mirrorlike field and the frosted or satiny (cameo) portrait or devices. In other words, this coin is not a "perfect" proof, but at 124 years old and of a small population (1245), it is still a very nice coin. The next three coins on our bourse tour are all of the five-cent denomination, and all were graded PR 66. The next five-cent coin on our list is a Liberty Head or V nickel designed by Charles Barber. When first introduced in 1883, the coin enabled the ne'er-do-wells to use the nickel to make a counterfeit five-dollar gold coin. Since the initial versions lacked a reference to denomination on the coin, only the Roman numeral "V" for five, the counterfeiters quickly coated the coins with gold and passed them as five dollars. Soon, the word "CENTS" was added to deter the criminals. This example, however, came from 1906 long after the thieves were thwarted. In this year, the US Mint's Philadelphia location produced less than 39 million of the Liberty Head or V nickels with only 1725 proof versions. 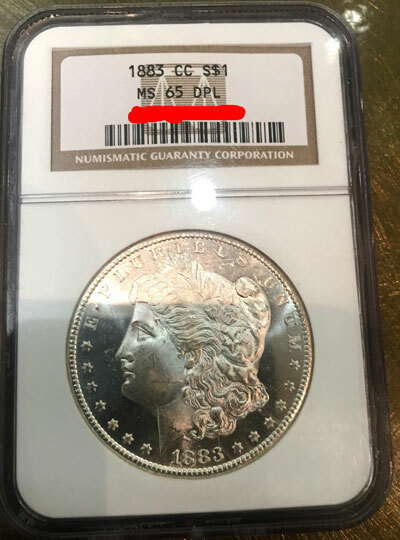 Liberty certainly shines on this 110-year old coin graded by NGC. Our last nickel is an Indian Head or Buffalo Nickel from 1915. The US Mint produced just over 30 million of the coins at their Philadelphia, Denver and San Francisco locations. At Philadelphia, they struck 1050 proof versions of the coin. This PCGS graded coin also has the green CAC sticker, which means the coin's grade was independently verified by the Certified Acceptance Corporation. Interestingly, on the CAC web site entering the coin's serial number from the certified holder yields more detail. For this example, CAC notes it is a 1915 Nickel Buffalo Type 2 Matte PR66 providing more insight into the coin. That completes our bourse tour for the May Greater Atlanta Coin Show. These coins represent a small, very small, sample of the numismatic items found on the bourse. Mark your calendars for the next monthly coin show on Sunday, June 12, 2016, and come see the dealers' displays and offerings of coins, currency, bullion and other collectibles in their showcases. A special type of Proof finish used at the Philadelphia Mint prior to America's entrance into World War I. The surface is prepared by a special die-etching or pickling process that gives a grainy appearance to the coins struck from such dies. At 101 years old, this Buffalo nickel is a beautiful example of the US Mint's production methods of the early 20th century.